Go North East Managing Director Kevin Carr will retire in June after more than 40 years with the region’s largest bus operator. 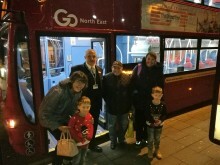 ​The region’s largest bus operator, Go North East, has appointed Stephen King into the new role of Commercial Director and Gary Edmundson as its new Operations Director. As the Angel of the North gets set to celebrate 20 years on Tyneside this February, Go North East has spent £4.5million on 19 bigger and greener double-deck buses for its namesake Newcastle to Chester-le-Street service.